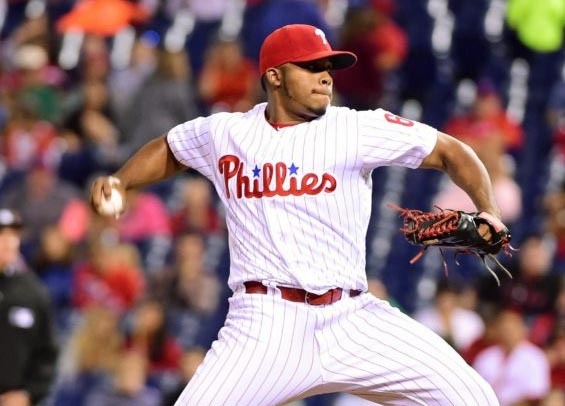 The Phillies placed reliever Edubray Ramos on the 10-day disabled list following the first game of Sunday's doubleheader with a strained left patella tendon. Ramos felt a twinge in the sixth inning and left the contest after facing just two batters. He'll undergo an MRI on Monday. The club will reinstate reliever Luis Garcia to fill the void in the bullpen. Yacksel Rios will join the Phillies as the 26th man for Game 2. "It happened on the very last pitch," Ramos said through a translator. "When my left leg landed I felt a sharp pain in the knee and it was weird." Ramos, 25, entered this afternoon with a 3-1 mark to go along with a 1.93 ERA over 38 appearances. He's been one of Philadelphia's most reliable relievers, so it's entirely possible this will be the catalyst for the club to make a move via the trade market. Ramos spent time on the disabled list earlier this season with shoulder discomfort.